Before each game, you must attend a short meeting (mandatory) during which we will explain the rules, and give you a few tips on how to avoid injuries. You also have to read and sign a waiver («discharge and withdrawal of liability, risk acceptance and compensation agreement») prior to the game. At the start of each period, and after one of the teams scores, players have to go back to their charge line (which has been determined by the two referees). At the sound of the whistle, players can rush to the ball in the middle of the field, and go on playing. When a referee blows his whistle, the game must stop immediately. Players who go on pushing and shoving their rivals could get thrown out of the game. It’s the referee’s responsibility to ensure safety for both players and spectators. A player who uses his feet to kick another player, or the equipment, could get thrown out of the game. There is no refund if this happens. Players can trade places with their goaler at any time. A game can also be played with 8 persons instead of 10 (goalers included), leaving one person on the bench. Those playing can then switch places, and get rested a bit, before returning to play more intensely. A group of ten will play 3 periods of 10 minutes each. It is possible to play a fourth period, as long as the game does not last more than an hour (breaks included). There will be a timed break (3 minutes) between each period. The ball can not go out of bounds. Since spectators are on the side lines, the referee will stop the game for safety issues. You have to make sure you don’t bump into people not wearing protective gear (either referee or spectator). To avoid leg injuries, do not push another player against the wall, or in a corner. When the ball goes out of bounds, members of the team at fault must stand at least 9 feet from the ball, and one player from the other team kicks it from the side line (at the sound of the whistle). It is strictly forbidden to play outside the field, to avoid injuries to those not wearing protective gear. Safety first! The goaler can only play inside his defensive zone, but he can push and be pushed. 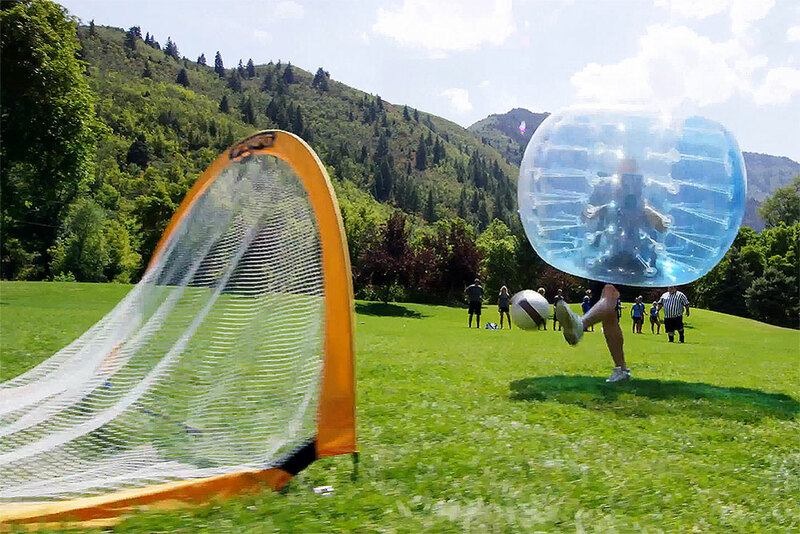 While playing, you must stay inside the giant bubble provided, or the referee will stop the game. You must tell the referee if your bubble loses air or gets ripped ; the game will be stopped, and we will provide you with a new one. You have to make sure you don’t bump into people not wearing protective gear (either referee or spectator). We recommend you wear knee-guards. You must also wear a helmet (like a hockey helmet without the visor), or one can be provided if requested. As a safety precaution, and to prevent lower hip injuries, it is forbidden to voluntarily aim your bubble at another players’s legs. To avoid leg injuries, do not push another player against the wall, or in a corner. It is also forbidden to fiercely go at a player who does not have the ball, or a player who is down trying to get up. You must play the ball and follow the game. Do not bump another player without making sure he saw you first. You’re responsible for your actions, and the consequences thereof. Play safe and responsibly, help each other when needed, or you can get thrown out of the game. There is no refund if this happens. If a net gets moved, the referee must stop the game until it is put back in its place. The goaler then plays the ball. At that time, members of the opposing team must be at least 9 feet from the ball. The referee is the one making the decision. After the game, you must clean your bubble (out of respect for those who will be using next). We will provide you with cleaning solution and cloth. This will only take a few seconds. Thank you for your collaboration. Be there at least half-an-hour before the start-up time, so you can change clothes, give the signed waiver to the person in charge, pay the fees, and even ask a few questions if needed. If you are late, you might miss practice time. And if one or two persons don’t show up, teams will have to play 4 against 4 (instead of 5). You cannot wear your eyeglasses while playing, only safety goggles with a head strap. You may wear contact lenses. It is strictly forbidden to wear sneakers with spikes to not pierce the bumper ball in plastic. There will be no tolerance on this regulation. Thank you.